Say you have a large archaeological site with many features and much to show. Say you want your site to be accessible to everyone who has an interest in it, regardless of their knowledge of the period or of archaeology in general. How would you go about showing what you have found in the most appealing and simple way to the general public? Of course there is not one single answer to this question, and many methods of public engagement are available to you. 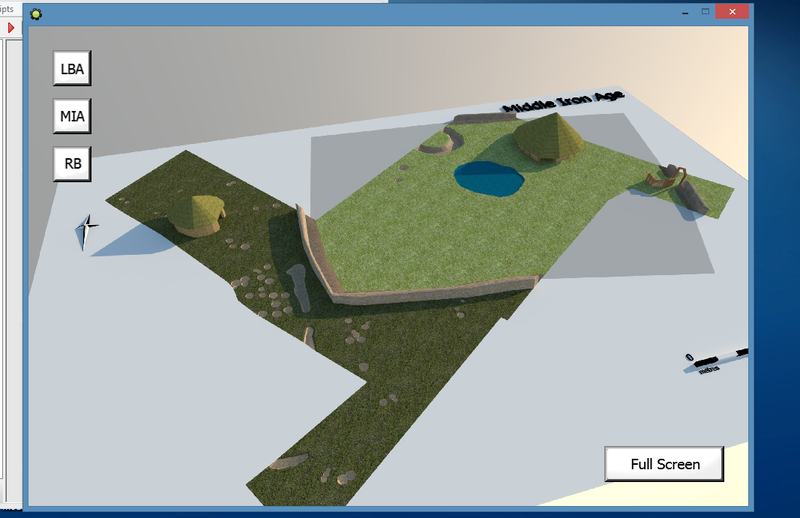 However I’d like to suggest a newer and more visually stimulating way of presentation, by combining archaeology with gaming software. 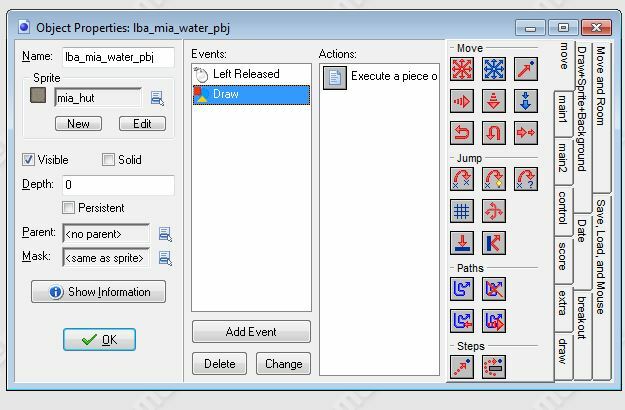 I personally enjoy playing around with Game Maker from time to time, a program specifically designed to create games in a simple fashion, and that can easily be adapted to create any type of program. But beware, Game Maker is not an easy program. Behind a simple-looking interface hides a complex script writing process that means you have to know at least a bit of programing to do anything good. Given the nature of the program the possibilities are endless, and the final result depends solely on the imagination and time available. One of the projects I was working on was to create an interactive plan of sites, which allowed the user to select different time periods and then click on the features to receive information about them. Having already created a 3D version of the plans in Sketchup for a different project I decided to use these again in order to save time and improve the visuals. I then proceeded to create a mechanism by which clicking on the features would direct you to another “room” where the information was. This was done by creating invisible boxes on the 2d surface and then telling it what to do when a specific box was selected. I then created buttons to go through the different time periods using a similar principle. 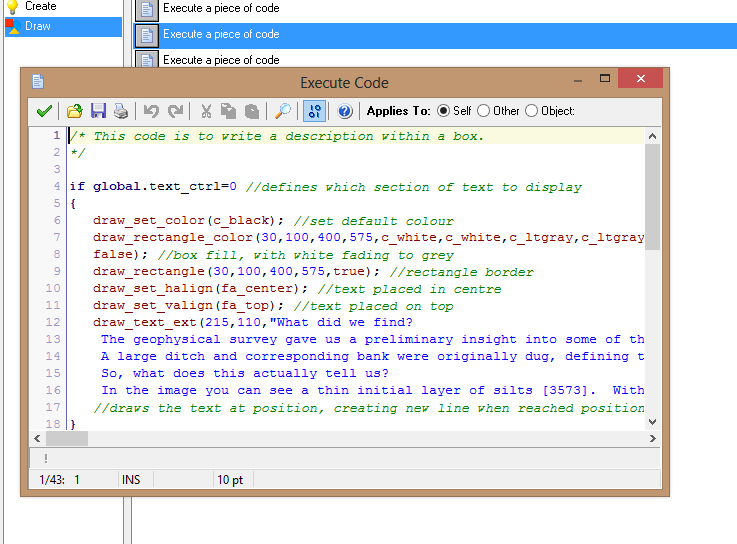 Finally I wrote the code and made sure it appeared within a box next to an image of the selected feature. I cannot give you the exact way in which I achieved this unfortunately for a number of reasons, first of which it would be pages and pages of text and code, but the basic idea is that I played around with the software until I achieved what I wanted: a series of snapshots of the site in 3D that allow navigation through time and that show exactly what we have found with images and text. 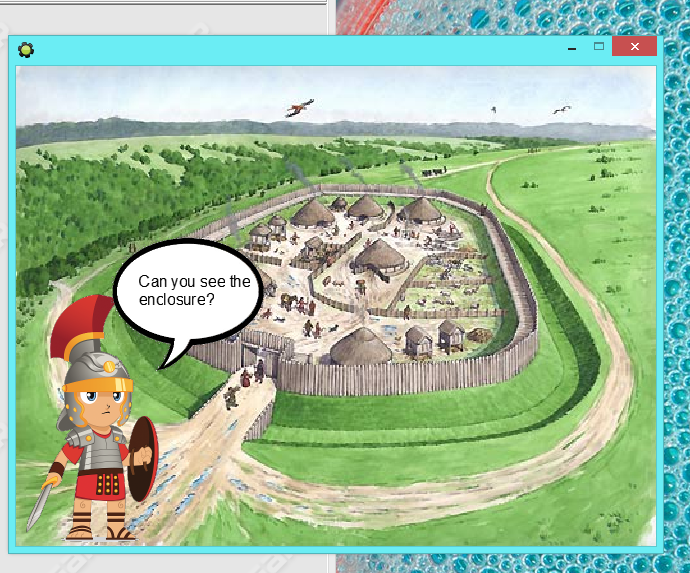 Another project I’m currently working on in instead a program for kids that allows them to interact with a roman soldier and help him carry out tasks. The aim of this is of course educational, and it displays the archaeological finds in a fun and interesting way that kids will enjoy. 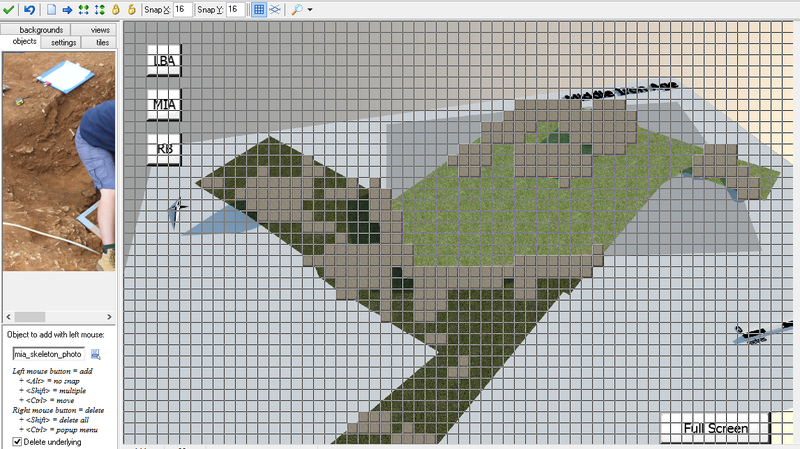 This one is made using a series of rooms that change every time you click on a certain portion of the map, depending on what the task is, i.e. if the soldier asks you to find the enclosure, then clicking on the enclosure changes the text. And these are only some of the ideas that can be made into reality. 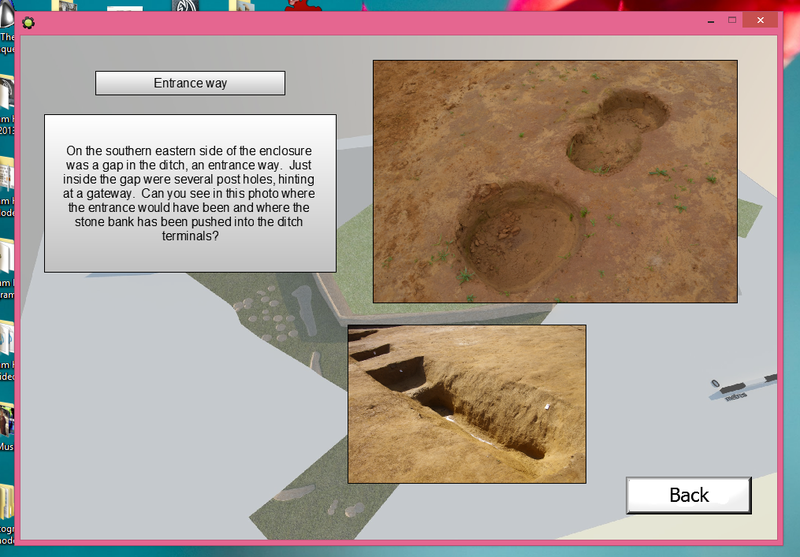 As odd as it may sound to use gaming software to create archaeology, the potential is great. Games like Assassin Creed or Skyrim have massive cities within them, with which the player can interact, so how much harder can it be to reconstruct entire sites and allow players to walk through them in order to learn more about them?